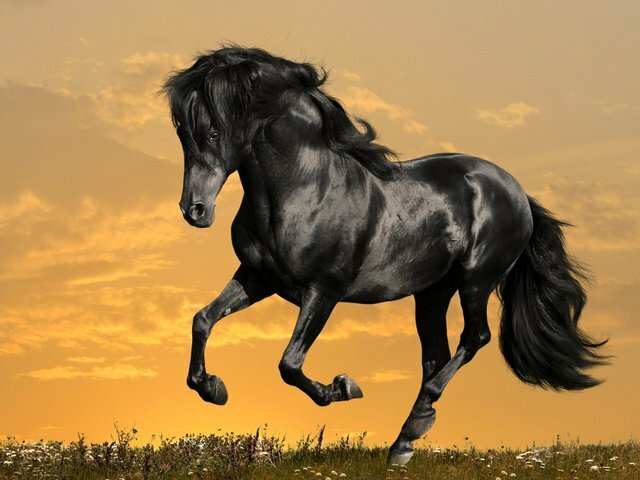 Wallpaper of a charming refined black Arabian horse with metallic sheen on his hair coat. The Arabian horse is one of the oldest breeds that originated on the Arabian Peninsula. All Arabian horses have black skin which provides protection from the intense desert sun, but the black coat absorbs heat and because of that the black horses are good for hard work in areas with colder climate. The Arabian horses are classified as breeds with 'hot blood' and good temperament. Their sensitivity and intelligence enables a quick learning and greater communication with their riders, including under 18 years.